I went to college in a really small town in Pennsylvania. Population: 5,710. The middle of nowhere. There were two bars downtown: the college bar, named after our mascot, and the other bar. The Towne Tavern. While the "e" in the name was added for historical flair, we liked to think of it as commentary on the bar's clientele; it's differentiating factor. Students did not go to the Towne Tavern. The townies did. And we were definitely not townies. We were sophisticated visitors. Just passing through to get our liberal arts degrees. On our way to something bigger and better. Fast forward to the present. 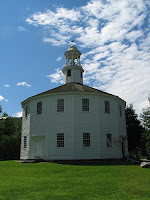 Hometown, Richmond, VT. Population: 4,500 (at best.) It's definitely safe to say that I'm more than making up for old times lost. Here in Richmond, it's not uncommon to visit the grocery store two or three times a day, each time running in to at least 10 people we know. The sign reads, "Richmond Market & Beverage" but we all call it the Market. 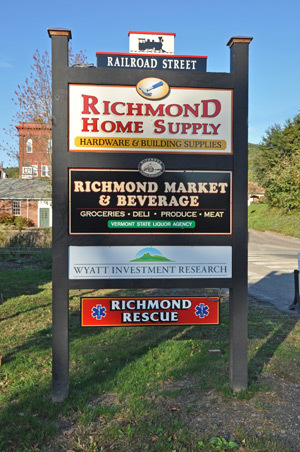 The hardware store, from which most of the materials going in to our new house are sourced, is called "Richmond Home Supply," but everyone calls it Dan's. Why wouldn't we? After all, Dan owns the place. Our pediatrician lives right across the street and Hudson loves to watch him mow his lawn, work on his house, and go for walks with his wife. "What Docta Parker Doin?" is a question he asks at some point every day, whether we're in the yard, driving to school, or getting ready for bed. This past weekend alone we watched the American flags go up along Main Street in prep for the upcoming 4th of July celebration; floated down the river in our canoe; went on a family bike ride across the rolling hills of farm country; went down the slides at the playground; enjoyed our Sunday morning ritual of scones and black coffee from the Bakery; kicked some balls around the local soccer-camp fields; and visited with good friends—all without leaving the village. And when tragedy struck here on Saturday afternoon, there wasn't a single one of us that didn't hear, see, feel, or mourn its affects. Part of the weekend was also spent looking for inspiration for the front door of our new house. We searched online and read through books featuring the best historic homes and buildings of New England, only to find ourselves directed to our proverbial (and almost literal) back yard. Sure, on most summer weekends, the adjacent field is full of cars with out-of-state plates. And when the wedding celebration ends, they all—including the bride and groom—go back to where they came from. Do any of them know that we too got married there? That we're on a first name basis with the guy who climbs up into the steeple to ring the church bell for their ceremonies? Do they know that in winter we fly down their "parking lot" on our Mad River Rockets? Probably not. And that's just fine with me. With the addition of trusses and roof decking this week, the "big hole" on Cochran Road—the project everyone in the village is talking about—has now become the "Big House." Its roots reach far deeper than the basement slab. It is the home in which we hope to share a glass of port with our new family when all is said and done. The place we hope to see our son grow into an honest, mischievous, and caring young man. It is the physical representation of all of the love and adoration I feel for this amazing town. Maybe, someday soon, we might find ourselves welcoming that new brew pub she and I chatted about. So what if it's only for us townies? I wouldn't really want it any other way.